There are billions of stars and planets in the universe. A star is glowing sphere of gas, while planets like Earth are made up of solids. The planets formed in dust clouds that swirled around a newly formed star. Dust grains are composed of elements like carbon, silicon, oxygen, iron, and magnesium. But where does the cosmic dust come from? 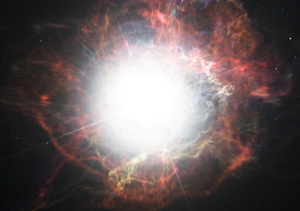 New research from the Dark Cosmology Centre (DARK) and Aarhus University shows that not only can grains of dust form in gigantic supernova explosions, they can also survive the subsequent shockwaves they are exposed to. The results are published in the prestigious scientific journal, Nature. How the cosmic dust is formed has long been a mystery to astronomers. The elements themselves are formed out of the glowing hydrogen gas in stars. The hydrogen atoms fuse together into heavier and heavier elements and in the fusion process the star emits radiation in the form of light, that is, energy. When all the hydrogen is exhausted and no more energy can be extracted, the star dies and giant clouds of gas are slung out into space, where they are recycled into new stars in a vast cosmic cycle. The heavy elements are primarily formed in supernovae, which are massive stars that die in a gigantic explosion. But how do the elements grow into ‘larger clumps’ like cosmic dust grains? “The problem has been that even though dust grains composed of heavy elements would form in supernovae, the supernova explosion is so violent that the grains of dust may not survive. But cosmic grains of significant size do exist, so the mystery has been how they are formed and have survived the subsequent shockwaves. Our research casts new light on this – both on how dust is formed and how it survives the shockwaves,” explains Professor Jens Hjorth, head of the Dark Cosmology Centre (DARK) at the Niels Bohr Institute at the University of Copenhagen. The researchers observe supernovae using the astronomical instrument X-shooter on the European Southern Observatory’s Very Large Telescope in Chile. Part of the X-shooter was developed and built by Danish researchers at the Niels Bohr Institute and what is special about the instrument is both that it is extremely sensitive and the three spectrographs observe all light at once – from ultraviolet to visible light to infrared light. This is extremely important when observing phenomena in the distant universe. Jens Hjorth explains that first they had to wait for the right, luminous supernova to explode. They were lucky and when it happened they initiated an observing campaign. 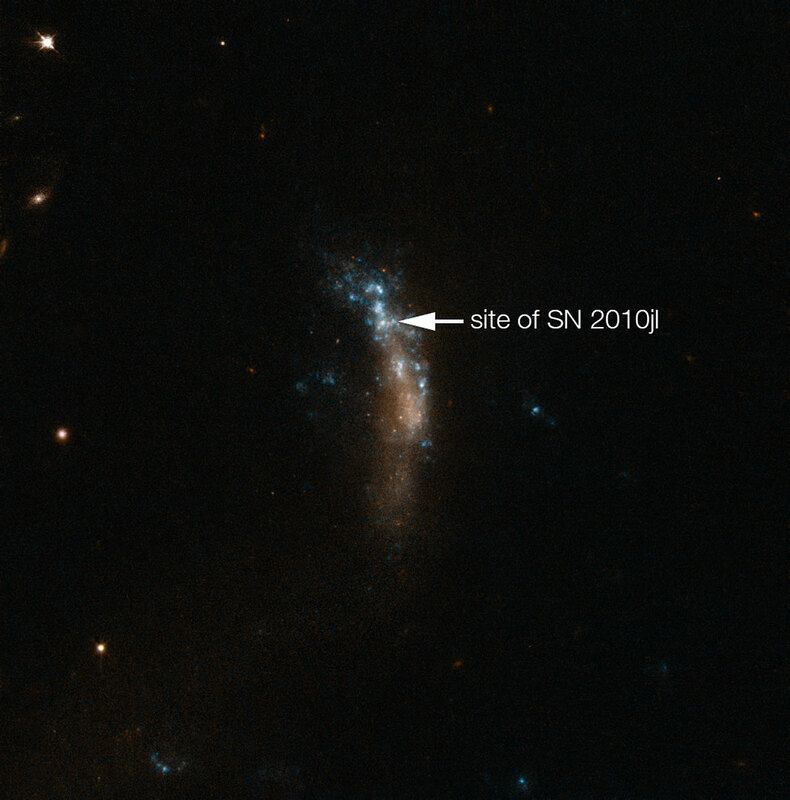 This was a very bright supernova, 10 times brighter than the average supernova. The exploding star itself had been very massive, more than 40 times the mass of the Sun. 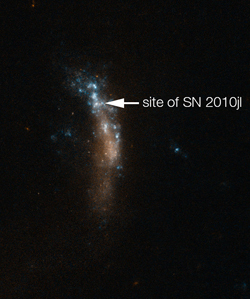 Researchers from DARK, Aarhus University, and NASA, among others, followed the explosion right from the start and the following 2½ years and analysed the light from the very bright supernova. “Dust absorbs light and from our data we could calculate a curve that told us the about the amount of dust, the composition of the dust and the size of the dust grains. This showed something very exciting,” explains Christa Gall, a postdoc at Aarhus University and affiliated at DARK. Christa Gall, who led the project, explains that the first step in dust formation is a mini-explosion, in which the star expels material containing hydrogen, helium and carbon. This gas cloud resides as a shell around the star. There are more of these outbursts and the shell around the star gets denser. Finally, the star explodes and the dense gas cloud take centre stage. “When the star explodes, the shockwave hits the dense gas cloud like a brick wall. It is all in gas form and incredibly hot, but when the eruption hits the ‘wall’ the gas gets compressed and cools down to about 2,000 degrees. At this temperature and density elements can nucleate and form solid particles. We measured dust grains as large as around one micron (a thousandth of a millimeter), which is large for cosmic dust grains. They are so large that they can survive their onward journey out into the galaxy,” explains Christa Gall. The researchers believe they have thus found an avenue for how cosmic dust can form and survive the violent shockwaves of supernovae.